A striking, robust porter full of warmth and chocolate malt. 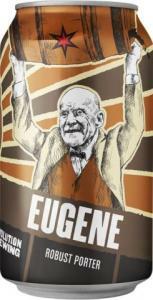 Eugene is a robust porter named after Eugene V. Debs, an American union leader and activist who led the Pullman Railroad strike in 1894. An assortment of Belgian specialty malts form a complex structure of toasted grain and caramel flavors. Dark chocolate malt makes this porter black as night and infuses it with its distinct intense, chocolate essence.